Hey friends! I would love to hear from you. 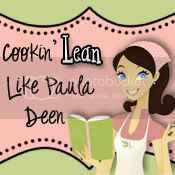 If you have any questions, comments or special requests for "Lean Paula Deen" recipe make-overs...just send me a little note! Thanks! We LOVE Hellmann's in the Cookin' Lean Kitchen. But long before we started using it in our lean recipes in 2009, Hellmann's has brought together the best ingredients - such as oil, vinegar and now cage-free eggs - to help bring out the best meals and moments to America's tables...for 100 years! 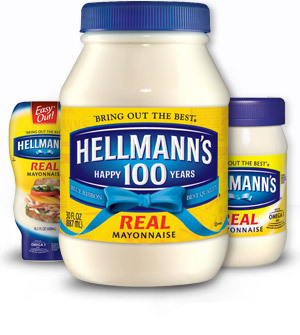 Like I mentioned, we LOVE Hellmann's here, especially the varieties created to keep recipes light, such as Hellman's mayonnaise made with olive oil, Hellmann's Light and my personal favorite, Hellmann's Low Fat Mayonnaise Dressing. Over the years, these Hellmann's products have made it possible to easily create lean makeovers to some of my favorite dishes, like Paula's Loaded Deviled Eggs and Jamie's Chicken Salad ...just to name a couple. Well since we LOVE Hellmann's so much around here and use it all the time, you can understand how thrilled I was to participate in Hellmann's 100 Year Anniversary Celebration. To celebrate its 100th birthday, Hellmann's is teaming up with celebrity chef Mario Batali to showcase how decades of delicious meals start with real, quality ingredients. Mario has given a modern twist to six classic Hellmann's recipes ranging from Fiery Chipotle Deviled Eggs to Hellmann's Chocolate Birthday Cake. Mayonnaise in a birthday cake?!?! Who knew! Mario was able to put some of his own twists on Hellmann's Classic recipes. His ideas of adding spicy chipotle to deviled eggs or using Hellmann's inside of a burger to create his Juicy Salsa Burger really got me thinking about new ways to reinvent the recipes we love. Of course this inspired me! That's what we do in the Cookin' Lean kitchen. We take inspiration from recipes we love and make them to fit our likes and needs. Being a part of this 100th birthday celebration was a must for me! Mario gives Hellmann’s® classic deviled eggs a spicy kick. Mario Batali puts his special spin on Hellmann’s® delicious chicken salad. Those are Mario's take on Hellmann's classic recipes. Check out what I did to make mine!! Place eggs in a single layer saucepan. Add cold water to cover my 3 inches. Bring to a boil and cover. Remove from the heat and let stand for 9 minutes. Drain immediately and fill the saucepan with ice and water. Tap each egg on the counter (with some muscle) and peel the eggs under running water. Slice the eggs in half and carefully remove the yolk. Place the yolk in a medium size mixing bowl. Add Hellmann's Low Fat Mayonnaise Dressing, chipotle sauce and raspberry preserves. Mix well. Spoon the yolk mixture into the egg halves (or use a piping bag if desired). Top with a little pinch of crumbled bacon and serve! Cook the pasta according to box instructions and set aside to cool. Add oil, chicken and onions to a hot pan. Cook until the chicken if fully cooked and the onions are soft. Set this aside to cool as well. In a blender, combine all ingredients listed below "Dressing", including 1/2 of the peeled and cubed cucumber. Blend until all ingredients are combined. Now you have the dressing! In a large bowl, add the cooled pasta, chicken, onions, olives, tomatoes, cucumber and feta cheese. Pour dressing over and toss to coat. Garnish with some dill. Serve and enjoy! Those are my twists to Mario's fabulous dishes. Now you can visit Facebook to watch Mario share his modern twist on some of Hellmann's classic recipes and ENTER TO WIN a seat at the Blue Ribbon table in NYC for Hellmann's 100th Birthday celebration. Join us at the Hellmann's Blue Ribbon table by co-creating a recipe with Mario and enter for a chance to win a seat at the World's Longest Picnic Table for Hellmann's 100th birthday celebration in September. Get started HERE! Join the fun! Your recipe could win you a trip to NYC!! Me and my little helper! Hi all! Just wanted to tell you a little bit about myself. In a nutshell, I am a 31-year-old mother of one little girl,an elementary school teacher, fitness lover and slightly new cook. My interest in healthy living goes way back to my years growing up in an active family. I have always been involved in athletics and made efforts to eat well. With a Bachelor's Degree from Elon University in Exercise/Sport Science, I am able to make educated choices about health and nutrition for myself and for my family. Exercise and healthy eating have gone from something I study, to simply a way of life. To top it off, my new found love for cooking has been a way to apply what I know and to tap into my creative side. This is my passion. Just to let y'all know, I am not Paula Deen. Although I did get to cook with her in Savannah last June, Paula is not affiliated with this blog. The same goes for Bobby, Rachael, Ina and Giada. I am simply a woman that loves finding inspiration in their fabulous recipes and making them work with my passion for healthy eating. The content of this site is protected under copyright law. Please do not use or reproduce without consent. Oh, and one last thing. The nutritional information provided was calculated using information gathered from www.livestrong.com and the packaging of the products used. They were not figured by a nutrition professional, but they are as close as I can get. Mix it well and store it in a shaker near your cooktop!